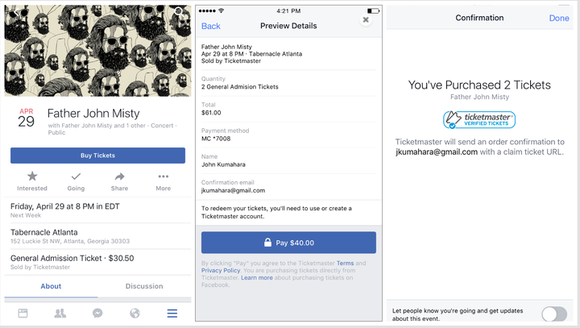 Facebook has partnered with Ticketmaster and Eventbrite to become a one-stop shop for events. Every concert-goer has had at least one Ticketmaster horror story, so now the company is looking to make the ticket-buying experience less painful by integrating with Facebook. On Monday, Ticketmaster announced that it would start selling select event tickets directly on Facebook by the end of April. When browsing an official event page on the Facebook iOS and Android app, you’ll be able to place your Ticketmaster order by clicking on the new “Buy Tickets” link. In addition, you’ll have the option to buy from Ticketmaster in the Facebook Messenger app via its experimental virtual assistant M, which can even send you a photo of your digital tickets before an event. “By putting the ability to buy tickets directly within Facebook we hope that we’re going to provide a more seamless purchase experience and sell more tickets,” Ticketmaster’s vp of distributed commerce Dan Armstrong told Macworld. As is typical with these referral partnerships, Ticketmaster confirmed that Facebook will be receiving the standard affiliate cut for each ticket sale made via the social platform. Ticketmaster said that convenience fees for customers who choose to purchase tickets on Facebook will remain the same. Even though ticket sales will technically be processed on Facebook, ticket buyers will still have to claim their purchase on the Ticketmaster website. In the beginning stages, this Ticketmaster integration will only be enabled for a select number of Facebook events with general admission. 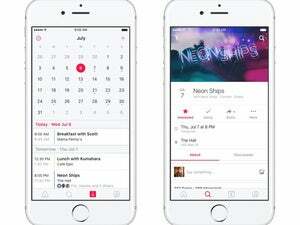 Update: Eventbrite will also be integrating directly to sell tickets on Facebook. 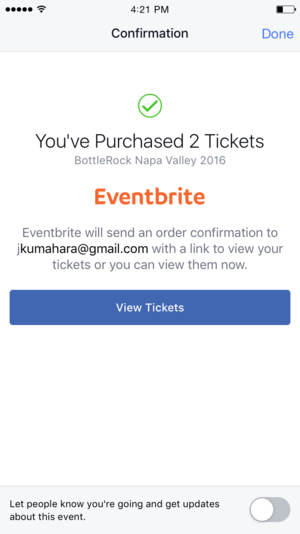 If an event’s official Facebook page is linked to an Eventbrite ticket portal, the “Buy Tickets” link will initiate the purchase on Eventbrite without leaving the FB app. Once its confirmed, ticket-buyers will be able to use Facebook to access their digital tickets with a QR code. Facebook will talk more about these pilot integrations during its F8 developers conference this week. 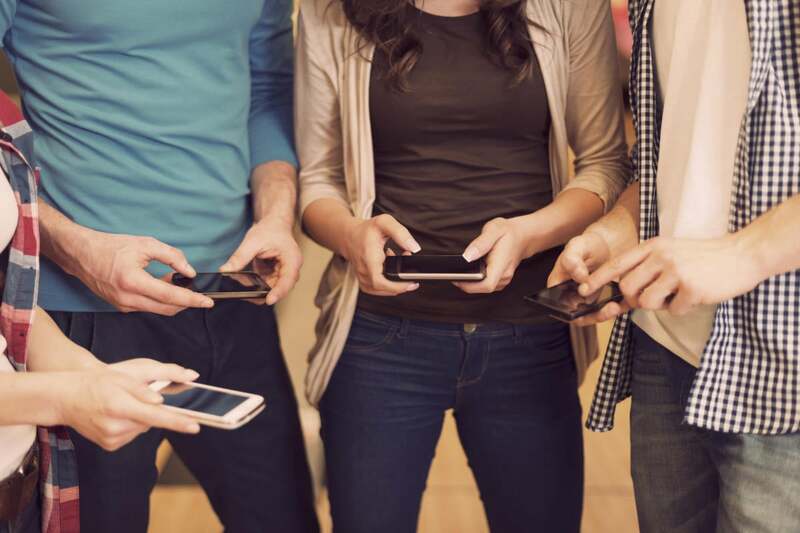 Why this matters: As mobile users shift away from installing and using a bevy of third-party apps, companies like Ticketmaster and Eventbrite are looking to get integrated into big services where smartphone users already spend most of their time. That means mostly Facebook and Google. But that doesn’t mean that Ticketmaster is forgoing development of its own standalone app just yet. According to Ticketmaster, 60 percent of their traffic comes from their mobile apps and the mobile web, and the company continues to invest with mobile users in mind. Facebook has already welcomed major publishers into its blue-colored fold with the introduction of Instant Articles. Now it seems the social network is looking to integrate other services, including merchants and retailers, so that Facebook’s 1.44 billion mobile users can spend more time doing what they would normally do online, but without leaving the app.